Josephine Marcus – a gutsy Jewish beauty — captured lawman Wyatt Earp’s heart in 1881, the year he fought the legendary Gunfight at the OK Corral. This first biographical novel explores the brief defining period when Josephine comes-of-age on the American frontier, weaving action, wit, and introspection. When Behan betrays Josephine, she leaves him—and immediately faces the harsh realities of being a woman on her own in the Wild West, a world where a lady’s every action depends on a man’s approval. Told from a richly descriptive female perspective, the book invites readers to feel Josephine’s desperation as she realizes the only available options she has are prostitution or returning home. That is—until Wyatt Earp declares his love for her. As their romance blossoms and their bond deepens, Behan’s jealousy ignites a rivalry destined for the history books. 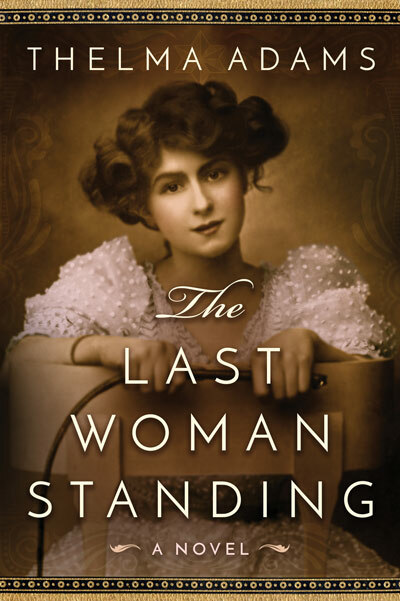 The Last Woman Standing is both an epic tale of an improbable romance and a retelling of an iconic American legend through a female lens. Josephine is a charismatic, fierce heroine who seeks to reinvent herself—and find her soulmate—in a lawless outpost among cowboys and lawmen, where few people are what they seem on the surface. I chose this book as my Kindle First selection this month for a couple of reasons. First, because I have read another work by Thelma Adams called “Playdate” see here: Playdate … and second, because I am an avid reader of historical fiction… particularly early American. This book hits both of those qualifications. Thelma Adams is best known for her work around the NY scene, particularly the film scene. She writes (and has written..) for many publications including the NY Post and has chaired the Film Critics Circle. Because of her penchant for writing for publication, you expect that her work should be clean and well edited…. and it is. It is a very welcome relief to find a novel that is exciting and interesting as well as exceedingly well written. There are a few tiny errors (but just a FEW.!! ), but truthfully you will probably be so absorbed in the story as to make them unnoticeable. This book is a story of a Jewish American woman in the early days of the American west. Our subject, Josephine Marcus, is a comely lass who lives with her family in San Francisco. She decides to throw it all up for a shot at love with a cowboy sheriff, Johnny Behan, from Cochise County, Arizona. Josephine leaves home when she is quite young (possibly as young as fourteen..??) and moves to Arizona where she eventually ends up in Tombstone. Her early “affair” with Johnny Behan turns out to be a mistake and she realizes it …. when she lays eyes on Wyatt Earp. Josephine is present during the “OK Corral” gunfight and her fate is sealed. Forever locked in a common law marriage with Earp, they stay together until he dies. Josephine and Earp travel extensively together, make money and lose money, and become quite the item for early American writers. Josephine has subsequently become a well-researched character in several books about Wyatt Earp. There is quite a bit of information around about Josephine, but very little (none..??) that actually documents her early teen age life. She was very protective of that part of her “history”… it is assumed because she was actually working as a prostitute in the Arizona territory after she left home. In any event, what you are reading is a fictional accounting of a very real person who lived a very real life with one of America’s best known lawmen/gunfighters. This is a love story in one of its truest forms. It attracts you because you can affirm feelings for all that is good (and bad..!) in the wild west of the late 1800’s. Dusty streets, horses, saloons, cowboys, and gun fights over honor, either real or imagined. Hard fighting men, often without a wife of their own, took solace in the saloons and the bawdy rooming houses. Angry words were exchanged and someone lay dying in the dirt street. The undertaker was often one of the busiest merchants in town and “boot hill” was a gathering place for all those who had an itchy trigger finger and poor judgement…… And through it all walked Wyatt Earp and Josephine. Their story, as told here, makes for a very pleasurable read. As a fictional accounting, a novel, it succeeds because it tells a story about characters with whom we are familiar. It tells a story about the softer side of a true wild west icon. It explains when and where and how Wyatt Earp and Josephine lived, worked, and loved. It describes a passionate life that surrounded the legend of Wyatt Earp. And, at the same, it allows us to keep the legend, the myth, alive. *****Was sad to see it end.